Based in Korea’s second-largest city, Busan, Wild Wave is making a big splash as the country’s first dedicated all-sour and wild beer brewery. Its CEO, Changmin Lee and head brewer, Junpyo Lee meet us for a beer and share with us their dreams of taking the sour beer trend to Korea and popularising these often-misunderstood styles. Although most visitors to Korea don’t make it past the megalopolis that is Seoul, Busan is a bustling port town with a lot to offer. From the country’s most famous beach, Haeundae, to fish markets like Jagalchi, teeming with all manner of sea creatures, the sea is a constant and benevolent presence. Other sites to explore include the multi-coloured Gamcheon Culture Village, or the Beomeo-sa Buddhist temple, set against an extraordinary mountain backdrop. We crack open a bottle of Wild Wave’s flagship Surleim dry-hopped sour, bright yellow in appearance, featuring an interesting mix of tropical and citrus hops and a refreshing, light sourness. Changmin, a cheerful and excitable guy with a clear passion for what he is doing, shares with us how it all started. He discovered the world of craft beer while studying in England. When he returned home to Korea with his English wife, he initially continued his career at a trading company. However, home brewing with his buddy Junpyo in their spare time, he learned as much as he could about sour and wild beer. The homebrew scene in Busan is particularly strong and renowned in Korea for its sour beer styles. The pair regularly entered homebrew competitions throughout South Korea and soon found themselves winning in the sour and wild beer categories. This inspired them to take the plunge and set up Wild Wave in 2015, initially contract brewing their recipes, so that they could test the market before ultimately setting up their own brewery. "At that time, when people tasted sour beer, they were shocked,” Changmin laughs. As with other countries, sours are not a mainstream beer style and so the decision to start Korea’s first sour and wild beer brewery was perhaps a brave one at the time. It soon found a strong following though and in April 2017 opened its own brewery near Songjeong Station, not far from the Haeundae beach and now one of only a handful of craft breweries in Busan. Changmin and Junpyo wanted to create the ideal place to explore their line-up, sitting among the brewery’s ever-expanding collection of barrels, in a country in which barrel-ageing beer is extremely rare. “We’re experimenting a lot with different wood,” Changmin says. Also serving high-end food and barbeques in the summer, their taproom has become a popular spot. It was here that Wild Wave hosted Funk Fest in December, a festival celebrating sour and funky beers, with informational talks about the styles and brewing methods. 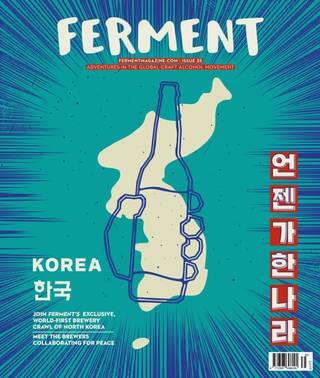 Now in its fourth year, the festival was also the largest sour beer bottle share ever in Korea, as well as a competition for experimental beers. It attracted an enthusiastic crowd of craft beer geeks and novices alike, all fascinated to understand and explore the flavours at the sour end of the beer spectrum. As for plans for the future, Changmin hopes to experiment with more Korean ingredients and likes the idea of creating Korea-specific sour styles. “We get inspiration for flavour from all kinds of cooking and from the likes of cocktails,” he says. They’ve also got their sights set on opening a bar in Seoul, to take sour beers to the capital. 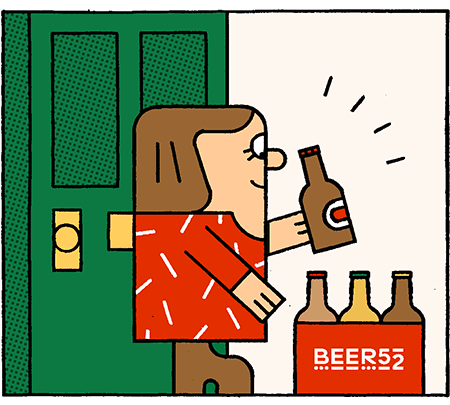 In this month’s Beer52 case, we’re sharing with you three incredible beers from Wild Wave. It is the first time that we’ve ever included a Brett IPA in one of our boxes and, as it’s a genuinely world-class example of the style, we’re all excited to hear what our members think. “It’s a really good chance to introduce our beer to people from other countries,” Changmin says, with an excited smile.